Never saw it Steve but I heard about it. Lucky you. And yes Whillans harness, my first one. I meant to say Don Whillans, not Joe Brown. See several glasses of wine dulls one thoughts. Don't wanna talk about it any more. One hundred feet, it made me sore. To climb with Skip Name nevermore. I fell off the top pitch of Lenna's Lieback to near ground on a bowline/coil. I'd loaned Skip the Dip my swami. Jerk. A great thread from 2007 when I first found this Super Topo thing and started asking questions. Lots of great stories here. Just click ' show all' and enjoy the history. You know we males think we have the skinny on how everything should be. Minutes after she was born my daughter looked up at me and seemed to ask, "just what is your function at this little ceremony?" I didn't have an answer. Now I do. My job is to make it possible and necessary for you to do what you decide you need to do. Chouinard showed up with his new aluminum carabiners and a supply of hand-forged chrome-moly pitons and a tale he was reluctant to tell except that it had an important moral. Up until that time we all used the time-honored method of tying into the rope by wrapping it once around the waist and securing it with a bowline knot. Yvon, ever on the prowl for improvements, decided to wrap and tie a ten-foot piece of one-inch webbing around his waist and tie the rope into that. There were several advantages. The leader would have a few more feet of rope at his disposal to make it to that comfy belay ledge (in this regard, it was also around this time that we started to use ropes longer than the conventional 120 feet, eventually settling on 150 foot ropes; harder climbs meant fewer ledges farther apart). It was also nice to know that should you need it, you had an extra ten feet of webbing, twenty counting your partner's, that could be used for rappel anchors or slings. Most important, in the case of a fall, the webbing would distribute the force over a considerably greater surface area than a 7/16-inch rope. It was this advantage that Yvon's tale illustrated. He had been climbing in the Tetons with Kamps, and they were attempting a new route on a spire called the Crooked Thumb. The upper half of the north face is generally overhanging, a feature that made it attractive to Yvon and Bob. As the story continues, we learn that this is where Chouinard falls over 150 feet. (75 feet out plus rope stretch.) I believe elsewhere it is listed as a ~160 foot fall. The details of the actual fall are quite long, so I decided not to transcribe it. For that, you'll have to read the book! Dayum Tar! If I were climbing with her I'd be happy to use a bowline on a coil. She is gorgeous. That's Helga, from 1987. Top of the Hobbit Book. I (and Looking Sketchy There) held Acapulco Bill go 120 feet on the Gullotine at Suicide. After we desperately pullied up 50 feet of rope while he was falling, he stopped 5 feet above the talus....and survived, and showed up at the crags the following day. 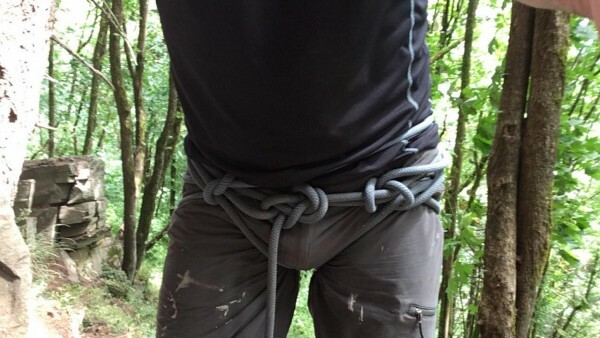 Forgot my harness the other day doing some lead rope soloing. What we used to do. In the early years on a Saturday punctuated by10th grade in high school I got roped into belaying the obvious wingnut “bill” on the classic runout 5.8 flake the Gullitine at Suicide rocks. Having just met him, I had a bad feeling about the whole thing. Bill started up the climb looking like he had read an article about climbing in Popular Science the week before and scavenged some gear from his climbing cousin Hector from Fresno. Bill began up the sharp flake looking very uncentered on his feet. When he needed to lean left, he leaned right. When a perfect nut slot landed at face level, bill put his fingers in it and nervously climbed on. With a huge runout beneath him Bill desperately grabbed a fixed sling and gingerly climbed passed it without clipping in. Randy, sittin on the ledge with me began to seem stressed. “Is he gonna clip something” he asked? “I sure as hell hope so”, I replied just as Bill shuffled in a discombobulated way with a solid 50foot runout beneath him. Everyone at the base went quiet. As Bill began to tremble at the 70 foot runout level, Randy got into belay position with me on the ledge, and prepared to move some rope quickly. About that time we were hearing audible grunts from Bill, now 80 feet over the tables covered base. I had to wonder what he was trying it prove...and had to ask myself why Inwas doing this rather that climbing the Flakes on Tahquitz with Roubidoux Jim a Wilson? Now traveling at a solid 50 mph and 80 feet about them deck, Randy and I kicked into action and began hauling as much rope as was sanely possible for us two mid-sized .wannabees. By the time Bill had come to a stop, he dangled upside down, five feet above the the ugly talus. More than coincidentally, a group with the Riverside Sarch and Rescue was directly below and kicked into action.They instantly cut Bill off of his lead rope, threw him in a stretcher and briskly shuttled him down the trail, and then down the road to the ER in Hemet. As we were finishing breakfast and preparing to go climbing, up limps “Acapulco” Bill followed by superstar John Long to get some exponential fame points for the weekend. Randy and I walked off to do a quick cruise of the technical and runout Rebolting Development, which we calmly cruised in perfect style. We decided that we preferred smoothly climbing in the groove, rather than frenetically almost dying in an toxic internal adrenal bath (like the one Acapulco Bill was detoxing from right now. I am humbled by this thread. As a dabbler in early 70s, I learned bowline on a bight, and was told to use a bowline for attaching rope to swami (when available), and self to anchors. Once, in a completely incompetent clusterfluck while top-roping, I almost got to test how long you can hang from a bowline on bight. In late 70s in college climbing club, I don't recall disapproval of the bowline per se, but was told (mostly for glaciers) to make a "harness" with a 15-foot piece of webbing, tying two leg loops near the middle then wrapping webbing (as swami) and tying whole mess together with climbing rope and/or biner. Maybe this was more standard at the time than I realize. I've almost no idea A bit later perhaps, I saw it illustrated in a then-current edition of "Freedom" textbook (Ferber). Tied correctly, it seems very effective. Surprised it didn't stick around more. Is very light and obviously more versatile than the real thing (and very cheap). Conceivably, for a long backpacking trip where roped glacier travel is a minor but unavoidable component.....it might make sense. I tied one up for a friend at the Gunks a few years back and some kids informed me that I was being unsafe. Another nickname, we used for that same tied webbing system, tied in leg loops and all. Only we called it a swiss seat, and used 21’ of webbing. Either we had a few extra wraps around us for climbing comfort or we were just fatter! Even after harnesses came out I would use swamis In squeeze chimneys and other offwidth’s for clearenc sake. 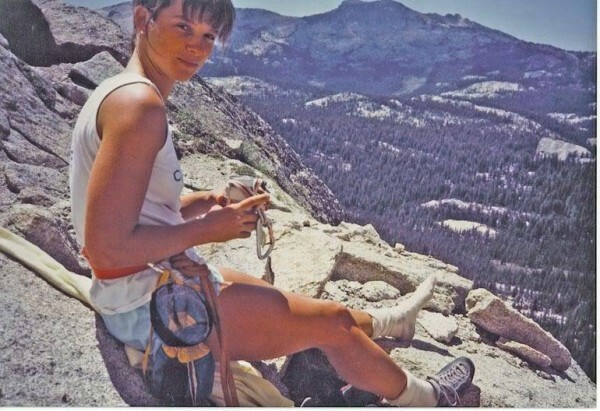 On the first ascent of Lucille,’88, I wore a misty mtn 3” buckle swami with no leg loops, thinking to save clearance and afraid a legloop would get hung up in there. By that time I was regularly using commercial harnesses for other climbing. another nickname - sounds like we were on the same timeline. Bowline to glacier rig/harness to swiss seat to manufactured harness. Still have my original seatbelt harness. You're right about know-it-all punks thinking a bowline is unsafe. Had a guy tell me I'd break my back. So I borrowed a harness and scampered up his "project" in my Vasque boots. Still have my 2” swami. I still used it on friction slabs. 30’ in the air (my partner couldn’t hear me and locked up the stitch plate) at the end of the pitch on Stirrup Trouble in the Gunks , so lots of rope out. Longest fall on slab.. 45 ft. At Stone Mountain NC. Not sure a slow motion slide counts. I remember getting a lecture from Jstan when I switched to a harness (he was still using 1” white stuff). He claimed you had a better chance of staying upright with a Swami and considering the last (short) fall I took on a harness flipped me upside down and I broke my helmet, there might still be some merit in that. This one deserves a bump before every thing gets deleted. Always enjoyed interacting with you fine people. 3 wraps of red 2" tube. Impressed enough we came back and measured 72' with my lips just about able to kiss the dirt. All good clean air thankfully. I did have some sore ribs for a while. But scared me more than it hurt. Long enough I had a LOT of time to mention I was falling and then think about it, seemingly a long long time! The adrenaline dump lasted the rest of the day. And it all started with bomber pro 15 or 20' below me while I was reaching for the anchor. A bad belayer. You hear that Dave???? !!! Bad :) Although trotting backward did keep me off the ground....gotta thank you for that buddy! Put a little safety back in "our program". I kept climbing in a swami for some time yet and still like them for the lack of phaff. Although after that one, no more untethered belays on the ground, fewer uses of a hip belay and better communication on what was "done" and off prior to actually clipping into the anchor. Truthfully? I had called "off" and had yet to clip. So excited to have freed the climb. Some how in my excitement and pump I simply fell off. Thinking back, in all the climbing I have done likely the most excitement ever on a rope. Just realized I never went back to get a red point.